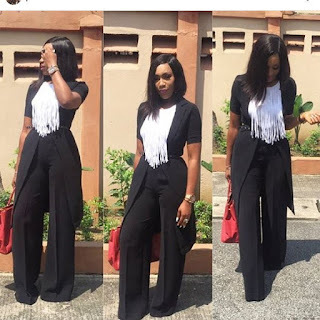 Laura Ikeji and Ogbonna Kanu love story plus Ebube Nwagbo connection. Now moving on to the main koko.The footballer got engaged to one of Nigeria's celebrity bloggers and the proposal itself was all ove rthe blogs and social media a few days ago.I was not convinced by that though,it looked all staged in my opinion,still,its all entertainment. The star though is not happy with Nigerian journalists as she feels they were the main reason for the relationship not surviving.“Oh yes, I blame journalists. They kept writing about us. Everything about me became news to them. I guess that is the price you have to pay for being a star. It was just too much. Anyway, I have learnt my lessons. The footballer has now found love with his new fiancee and already they are starting to receive press.Lets hope they don't repeat what they did with Ebube. Laura and Ogbonna met through mutual friends about a year ago and they have gone from strength to strength since. Now that younger sister is about to walk down the aisles,the main question most social media friendly Nigerians are asking is,when is big sister Linda Ikeji going to get married?